Fettes studies medicine at Edinburgh and works under and lodges with the anatomist Mr K____ (Stevenson was probably referring to the anatomist Robert Knox, who infamously received bodies for dissection murdered by Burke and Hare). Fettes is also in charge of receiving and dividing bodies for class vivisection. One night, the body of Jane Galbraith, a woman Fettes had seen alive and well only the day before, is brought to the rooms. Fettes suspects foul play and confronts the class assistant Wolfe Macfarlane. Macfarlane confirms it was murder but warns Fettes to say nothing. After work one night, Fettes meets Macfarlane who is accompanied by an insulting and insinuating man called Gray. Later, Fettes is startled out of sleep by MacFarlane bearing Gray’s murdered body into the dissecting rooms. Fettes is horrified by Macfarlane’s crime, but his uncertainty of what to do keeps him silent. Meanwhile, he gives Gray’s corpse to the medical students for dissection. “[t]he light fell very clear upon the dark, well-moulded features and smooth shaven cheeks of a too familiar countenance, often beheld in dreams of both of these young men [. . . ] the body of the dead and long-dissected Gray’”(p. 298). Terrified, they jump from the gig, which continues towards Edinburgh with its uncanny load. 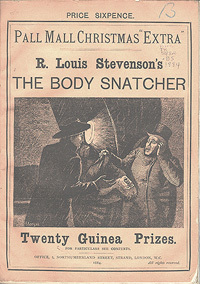 Quotations taken from “The Body Snatcher”, The Works of Robert Louis Stevenson, Swanston edn, vol iii (London: Chatto and Windus, 1911).